Linux is a big deal in modern movie-making. Whether you're a hobbyist or a professional, you can find Linux software that meets your needs. It's pretty well known that Linux is a big deal in modern movie making. Linux is the standard base, a literal industry standard for digital effects but, like all technology with momentum, it seems that the process of cutting footage still defaults mostly to a non-Linux platform. Slowly, however, as artists seek to simplify and consolidate the post-production pipeline, Linux video editing is gaining in popularity. It can be difficult to talk about video editing objectively because it means so many different things to different people. For instance, to some people a video editing application must be able to generate fancy animated title sequences, while professional users balk at the idea of doing serious work on titles in their video editor. It's not unlike the debate over professional SLR cameras that happened when digital cameras in phones became contenders for serious photography. 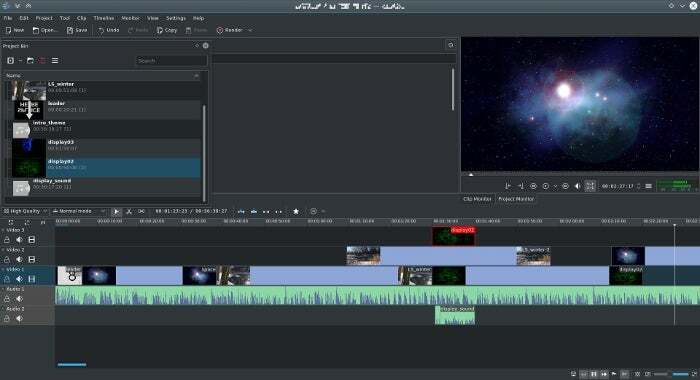 For this reason, a pragmatic overview of a Linux-based video editor needs two broad qualifiers: How it performs for home users, and how it might integrate into a professional pipeline. Independent: For the purposes of this article, I'll call a workflow that begins and ends with either one video editing software or one computer system either "independent" or "hobbyist." In other words, an independent or hobbyist filmmaker is likely to use one application to do video editing, maybe a few other applications for specialized tasks like audio sweetening or motion graphics, and then they're done. Their project is exported and delivered. Professional integration: A "professional" editor probably also uses only one application to edit video, but that's because they're a cog in a larger machine. A professional editor might get their footage from a producer or director, and when they're done they probably aren't exporting the final version that their audiences are going to see, but they'll pass their work on to audio engineers, VFX artists, and colorists. Kdenlive is the best-in-class professional open source editing application, hands-down. As long as you run a stable version of Kdenlive on a stable Linux OS, use reasonable file formats, and keep your work organized, you'll have a reliable, professional-quality editing experience. The interface is intuitive for anyone who has ever used a professional-style editing application. The way you work in Kdenlive is natural and flexible, allowing you to use both of the major styles of editing: cutting by numbers and just mousing around in the timeline. Kdenlive has plenty of capabilities beyond just cutting up footage. It can do some advanced visual effects, like masking, all manner of composting (see this, this, and this), color correction, offline "proxy" editing, and much much more. The greatest weakness of open source editing is also its greatest strengths: Kdenlive lets you throw nearly anything you want at it, even if that sometimes means its performance suffers. You should resist the urge to take advantage of this flexibility and instead manage your assets and formats smartly. Instead of using an MP3, convert the MP3 to WAV first (which is what other editors do for you, but they do it "behind the scenes"). Don't throw in an animated GIF without first breaking it out into a series of images. And so on. Gaining flexibility means you gain the responsibility for maintaining a sensible media library. The interface, while accounting for both "traditional" editing styles and the "modern" style of treating the timeline as a sort of scratchpad, wouldn't really satisfy an editor who wants to cut by numbers. Currently, there's no way, for instance, to modify or move clips with quick number-pad entries (typing +6, for instance, has no effect on a video region's placement in the timeline). If anything, Kdenlive could be overkill for home users who aren't accustomed to professional-style editing. Basic operations of the interface are mostly intuitive, but new editors might feel that there's a learning curve for advanced operations (like layered composting and offline editing). On the other hand, it scales down well. You can use a fraction of its features and find it a pretty simple, mostly intuitive editor. And for serious home editors and independent movie makers, Kdenlive is worth learning and using, and it is likely to satisfy all requirements. It may not always be a drop-in replacement if you're transitioning from some other editor, but it's familiar enough to keep the learning curve manageable. If you're working in a production environment with an established workflow, then any change to your editor requires adaptation. Kdenlive saves projects as an XML file, so it's possible to convert an existing edit decision list (EDL) to a Kdenlive project file, although there aren't any official auto-converters available yet, so round trips (i.e., returning to the original application) out of Kdenlive would require intervention. Alternately, round trips can be done with lossless clip exports, which can be reintegrated into a project after whatever has been applied from the external application. The same holds true for audio. You can render audio to a file and import into an external digital audio workstation (DAW), but currently there's no native, built-in audio-export target for popular formats like Open Media Framework (OMF). For the most part, as long as your pipeline isn't perilously rigid, Kdenlive can exist within any professional environment. It can output video, audio, and image sequences, and it's hard to imagine a workflow where such generic output isn't acceptable. OpenShot is a simple but robust video editor. If you're not interested in learning the finer details on how to edit video, then OpenShot is for you. It doesn't scale up; a professional editor will find it restrictive, but for a quick and easy edit, OpenShot is a great choice on any OS. OpenShot is focused. It understands exactly what its audience wants: the ability to make attractive videos with minimal fuss. Its interface is intuitive, and what you can't immediately figure out from context, you can access with a right-click. The most common transition, a crossfade, is available by overlapping the edges of two clips. This is such a simple and obvious trick, but it cuts down on so many mouse clicks that you'll wonder why all video editors don't do that. It's also a very conservative application. You won't see a new OpenShot release every month, and that's a good thing. You can download OpenShot as an AppImage today and use it for the next year or more. It's a beautiful, comfortable, simple piece of software. A hobbyist's strengths are a pro's weaknesses. It's a deliberately simplified system, and little conveniences like the auto-crossfades are unwelcome to a professional editor who doesn't necessarily want clips to crossfade when they overlap. OpenShot doesn't have a very robust engine for real-time effects. Too many dynamic effects severely slow playback. An independent or hobbyist editor with simple needs will find OpenShot perfect. It's an easy install, it has all the usual benefits of open source multimedia (near indifference to codecs, no false limitations or paywalls for advanced features). Integrating OpenShot with a larger pipeline is possible, but only in the sense that it can output generic video and audio files and image sequences. Its project file format, however, is also open source, and it saves into a JSON format that theoretically could be leveraged for an EDL, but there's no built-in exporter for that. Kdenlive and OpenShot are my top picks, the open source editors an editor ought to turn to for a quick fix, but there are, of course, several others to look at. Flowblade is a simplified video editor that focuses on the editorial process. If you're an experienced editor and just want to get down to business, or you 're a hobbyist who needs little more than an interface to assemble video clips in sequence, then Flowblade's minimal interface may appeal to you. A no-frills, stable application for quick, no-nonsense cutting. Its workflow favors a traditional cutting style: mark in, mark out, dump into timeline. Rinse and repeat. This makes it slightly less convenient to stumble around your project in search of a good edit, but that's what makes it so efficient and smooth when you know what you want. A professional-level editor who lives to count frames and edit on the keyboard will love Flowblade. Flowblade's interface is arguably overly simple. At the time of this writing, its keyboard shortcuts are not user-definable (although it's written in Python, so an editor fluent in Python can adjust preferences by brute force). Many of the "obvious" things a hobbyist would expect from a video editor just don't happen in Flowblade. For instance, moving a clip once it's in the timeline requires activation of an "overwrite" mode, since otherwise clips "float" left. In addition to generic video and audio files, Flowblade can export to MLT XML for use with the open source multimedia framework that powers it, as well a plain text, parseable EDL. Additionally, Flowblade's project format is plain text and could be used to extract information for a custom EDL format. These options don't provide specialized hooks into specific applications, but it's certainly enough of a variety that a simple converter should be able to import the information. Blender excels at efficiency. Once you know how to interact with its interface, you can accomplish amazing things amazingly quickly. Transferring this kind of efficiency over to video editing is a dream come true. By default, Blender's video sequence editor (VSE) is, from what I can tell, optimized for only the most basic "editing" tasks. This makes sense, given that in the animation and VFX world, there isn't generally excess footage. Artists work on shots that have already been finalized, so the only editing task after all the animation is done is to reintegrate shots into the final cut of the movie. Luckily, though, there are several plugins (such as Easy-Logging and the Blender Velvets) in active development to apply traditional editing interface conventions to Blender's VSE mode, and they manage to transform Blender into a very usable video editing software. Blender is stable, fully cross-platform, popular, and under steady development. Using it to edit video isn't exactly common, but the application as a framework for multimedia work is robust and reliable. If you're expecting a traditional editing platform, Blender's weaknesses are many. Its interface can be confusing, and the UI is unconventional as a video editor, at best. Even with VSE plugins and personal customizations, the interface is mostly utilitarian. Blender's rendering engines are backends for 3D model rendering. Rendering a video sequence, especially with effects (like color correction, which one would expect to have on each clip in a primary editing application) applied to each clip, takes far longer (10x as long from Kdenlive and Flowblade, in my most recent tests) than rendering from any other video editor. This might be partly because the Blender interface offers no control over FFmpeg threads. The VSE lacks integration with the rest of Blender. You cannot, for instance, attach clips from your VSE edit into the node editor and apply fancy effects. In Blender's internal pipeline, the VSE is definitely a separate process. A hobbyist who knows nothing about Blender will find a steep learning curve. Even with VSE add-ons to make the VSE act more like a "normal" application, anything beyond basic cuts and sequencing just doesn't work the way most users would expect. Like all powerful applications, however, Blender is by all means worth knowing. In terms of application design, it's one of the best examples, outside of Emacs, of combining internal logic and consistency with endless extensibility to produce a powerful, unstoppable force of computational wonder. Depending on your industry, your production house may already be using Blender, if not for video editing then for animation or motion graphics. There are several EDL export add-ons available, and Blender's seamless integration with Python makes it trivial for a technically minded editor or support staff to export whatever information is necessary to blend Blender into any pipeline. Shotcut is a video editor being developed by Dan Dennedy, an MLT co-founder and current project lead. It is designed from the ground up to be cross-platform and leverages new technologies like WebVfx (visual effects created with web technologies) and Movit (GPU image processing). 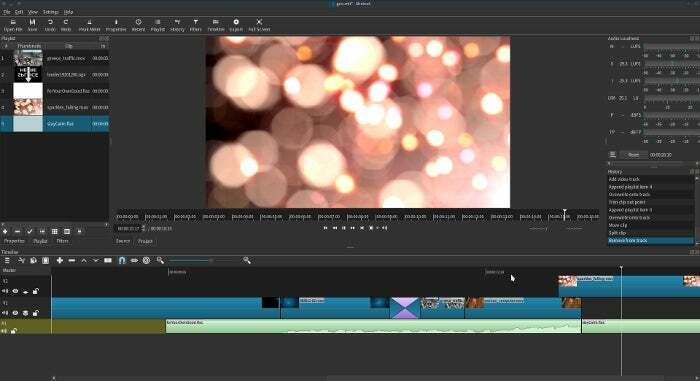 Shotcut is using the latest in open source technology to provide performance unlike any other open source video editor. Its real-time effects are smooth as is, and they will get even better once it's offloaded onto the GPU. The interface is mostly familiar, although some liberties are taken in the interest of progress. One wonders if mobile devices are on the roadmap, because much of the interface design would work well on a tablet or a large phone screen. Shotcut is JACK-aware, so tethering it to a pro audio application like Ardour is trivial. Shotcut is a little progressive, so there's a learning curve involved where its interface implements something different than the de facto standard. For instance, the workflow in a traditional editor is: bring a clip into your bin, open that clip from the bin, mark in and out, and put it in the timeline. With Shotcut, however, there's no internal import process to populate your bin ("playlist," in Shotcut terminology). You can either drag and drop from your file manager or you can open a clip and add that clip to your playlist, or you can bypass the playlist entirely and just add it to your timeline. It's less esoteric, for example, there's no way to group select several clips in the timeline to move them. You can insert clips in front of them, but editors used to using their timeline as a scratchpad with lots of groups of edited scenes might find this limitation troublesome. The effect stack is still a work in progress. Important effects, like a chromakey (green screen), are missing. They're being added as the dev team perfects their interfaces and functionality. For basic editing, Shotcut is a breeze. It's uncluttered, relatively lightweight, and functional. It's got everything you need and doesn't offer a lot of options you probably don't intend to use. In its current state, it doesn't scale up. When you hit its ceiling, you'll have to move to another application. For some, this might be when they suddenly realize they need to do complex composites (to be fair, it's arguable that complex composites shouldn't be done in a video editing application at all, but that doesn't change expectations), while for others it will be small interface preferences, like Shotcut's inability to dynamically create a new audio track when dragging an audio-only clip into a timeline with only one video track. Shotcut isn't production-ready yet, but since a true professional is more than the sum of the tools, it could be used in a professional setting. Shotcut can export an EDL, and it stores its project files as MLT XML, so you could extract information for a custom EDL format as needed. There's a handful of cross-platform editors that are not open source. However, they can run on an otherwise open stack (in other words, they are fully Linux-compatible), which is a pretty common paradigm in the professional film world. A not insignificant advantage to these closed-source solutions is that a team of editors can use the same software regardless of the OS they're running. A long-time editing solution in Hollywood, Lightworks is now free to download. While its natural approach to editing defers to a traditional film workflow, working in the timeline is possible and new features are constantly being added to make sandboxing in the timeline comfortable. The free version is basically a complete solution for serious editng, but if you pay for a subscription you "unlock" better codec support and a few effects (which are, awkwardly, not cross-platform). Nobody would call Lightworks the industry standard, but it is an Emmy award winner and has a long history of professional use before it became no-cost software independent of its hardware stack. It's a robust application with some serious pro features, such as timeline effects, codec support, lots of export formats, and a unique but efficient interface. It's a technical editing environment. It's very aware of editing decisions and timecode and frame numbers, so if you are a professional editor who needs to know that your edit can conform later in the pipeline, Lightworks won't let you down. Real-time effects are well supported in Lightworks, so performance is as good as your system specs provide. It's not open source. Its development team announced many years ago that the code would be released in Q3 of 2012; now the official stance in the forums is that "Lightworks is freemium software." Furthermore, Lightworks is not a lightweight application. It expects a powerful rig, and at a certain point, it bottoms out and just plain won't run. Lightworks' default editing style in many ways mimics the traditional film-editing process. Its timeline is designed for keyboard and shuttle control. Hobbyists or editors who were trained to do their editing with the mouse might find Lightworks a little difficult to get used to. With each new version, the timeline gets a little more mouse-friendly, but the overall design is somewhat technical. Lightworks is probably overkill for the hobbyist. It works well, but there's a learning curve and an emphasis on precision and professionalism that will probably get in the way for people who just want to edit. Lightworks exports to a number of formats, such as OMF and AAF, so it's prepared to communicate with whatever's next in your pipeline. If it doesn't export to what you need, it does export to a variety of video and audio formats. Coming from Da Vinci's color correction suite, and once tied to a proprietary hardware suite, Resolve is a cross-platform editor distributed for $0. Da Vinci has been an industry standard for decades, and while Resolve is technically relatively new, many professionals in the industry have some familiarity with the system in general. Resolve, like Lightworks, has hefty hardware requirements. If your system doesn't meet its requirements, it doesn't run. There's no lightweight mode, even if you just want to do some basic edits. Resolve is not open source. Resolve is probably overkill for hobbyists, but its interface is flexible and allows for several editing styles. Its interface is fairly intuitive; if you've used a video-editing application before, you can probably figure out Resolve with an afternoon and a few online tutorial videos. Da Vinci exports to several exchange formats as well as video, audio, and image sequences. Hiero isn't, strictly speaking, a video editor, but a show viewer. However, it's set up such that clips can be arranged and adjusted, so it sometimes gets used as a video editing solution by artists familiar with other Foundry tools. Of course, there are still more options. Some, like Pitivi and Cinelerra, are less active and less stable now than they may have once been, others, like Avidemux, are limited in scope, and still others, like using FFmpeg directly, are just too niche to cover. 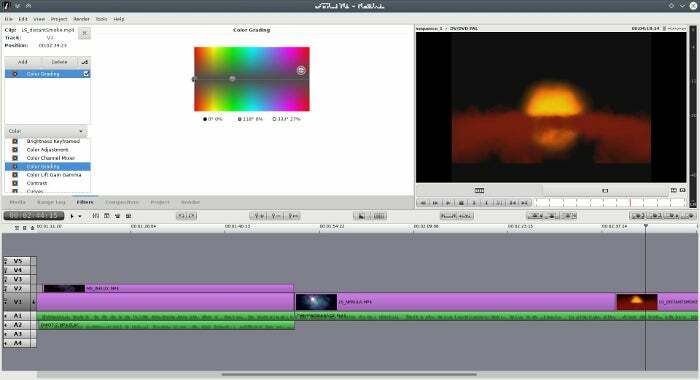 The point is that there are plenty of very good video editing solutions for Linux. All you have to do is choose one, and get creative. A great article. Well considered and informative. I've used Kdenlive for years for light-scale professional videos. Lately I'm working on a Mac and am using DaVinci Resolve. I'll be building my own system and getting back to editing on Linux. I'm looking forward to working with Resolve and Kdenlive on Linux again. How/where do I get a "stable version of Kdenlive on a stable Linux OS" as mentioned above? I switched to linux 4 months ago and If it starts in the morning then the next question is how long before it locks up and/or completely crashes. I have enjoyed the way the article is laid out and it is clear that the author has spend a lot of time and effort on some in-depth research. However, I feel that video editing on Linux is still slightly oversold. Why? Because the author has not addressed something as fundamental as stability. Kdenlive in the experience of many people is not very stable. So, while it is capable, it crashes relatively often for many people. To date I was not able to use it with confidence. Yes, you can get things done, but it is an unpleasant process. OpenShot is an incredible instable program. Not a single time in my life was I able to complete a project with it without it crashing every other operation. Click a button? Crash. Move a clip? Crash. OpenShot 2 was lauded as The Video Editor, but turned out to be even worse, in a way. Now it would freeze often and would crash even if you just move a clip onto the timeline. I have no idea how the developer manages it, but I have tried OpenShot 2 on several machines, on several versions of Ubuntu - and each time it would crash before I could even start any work. And it is incredibly slow. If your video is not a small 300x300 box or something - the preview will just freeze the editor. In that sense the only usable option is Blender. I liked how the author summarized it, and it is - unlike Kdenlive and OpenShot - is very stable. It has crashed on me 2 times in my life, both during a rendering process, when I was trying to do something while the video was rendering. I've been a Kdenlive user since 2008, and I've not had the experience you're describing. I run it on Slackware, with most components of my multimedia workflow compiled from source code. I'm not sure how much of a difference that makes, but it's a data point. I also manage my media carefully, and transcode to "sensible" formats for editing. Editors on other platforms do this for the user, and usually more or less in the background; that's why, when you import video into your $proprietary_editor, there's often a stage where it "processes" or "optimizes" the video. On Linux, I do effectively the same thing and, especially on big projects, I edit in formats that I feel are mature and well-supported. Linux editors tend to allow you to *try* to edit pretty much anything you throw at them, but in my opinion, it's not always smart to do that. A good way to troubleshoot your workflow is to settle on one format for video (like ffmpeg's mp4, Xvid, mov, or even huffyuv if you have the space) and one format for audio (wav or flac), and see if that helps eliminate crashing. Openshot does not work and EATS every resource. I was a quite happy user of the debian package until it got upgraded to the 2.x. When appliying the audio filters, apart from not being intuitive what is going on, the video file producded is not the same as that in the preview. Further more, the last 3 daily snapshots I have tried either crash, do not export and/or have the same problem mentioned before. Plus eating all the resources (I have 32GB of ram, that damn AppImage should work just fine). I had substitued it with ShotCut and is by far way better, though less intuitive as written in the article. I'm missing Pitivi here, would have been nice to see a comparison. ...and that's why most of the movies in theaters today were made on 6-year old Linux distros running software from 2 years ago. Much of the multimedia industry prefers stability over new features. I am very slow to update my production software, and OpenShot (which I use for teaching rather than for production) is no exception. I didn't include PiTiVi because its website indicated that its latest release was 0.98, 2 years ago. While I favour slow-moving software, it concerned me that there was *no* development activity. Now that I'm looking closer, I see that there was a release just 6 months ago and that actually it's just their website that's more or less unmaintained, not the project itself. You're right; PiTiVi is worth a look, although I'd want to use it on at least one or two real-life projects before writing down an opinion. Thanks for mentioning Pitivi! Our project is very active. In the past years we fixed lots of bugs and polished the UI to make it stable and easy to use. Pitivi got close to version 1.0 by releasing the first RC last autumn. We are focusing a lot on stability and we want 1.0 to deserve its name. We are feature frozen on it. Stabilizing takes time but we are definitely getting there! Apart from the stabilization (which involves solving high complexity bugs in the entire stack), last year for example we had three GSoC students working on features which will be part of version 2.0. Yes, we did not even release 1.0 and have features implemented for 2.0. Note they can be used already easily by installing the "master" branch using flatpak. Similarly you can very easily install and use the "stable" branch, using flatpak. This is one reason why we're not very focused on releasing. You could also mention that Shotcut is the one to go to if you need to edit 4K video and seek for interesting frames. At least OpenShot did not do the job, too slow for moving around in the preview with 4K source material. Great point. I don't usually edit directly in 4k, because I have no reason to. I offline my footage and work with proxies. This is pretty common in the film and video industry - not that 4k isn't editable; it's just a question of what you want to spend your 'cycles on. That said, good 4k (and beyond) handling is important, and I expect that as ShotCut continues to develop, it's going to do some amazing things all round. I really appreciate this article. I have seen so many that just list the names of the linux video editors, but no comparative information or depth on the pros and cons. A truly useful analysis! Thank you Seth! I'm glad you found it useful! I do hope that it appeals to lots of different types of users. Odd that you don't mention a t of the powerhouse pro linux editing apps. Flame and smoke both originated on sgi irix but were ported to Linux over a decade ago. DaVinci resolve likewise was Linux only until a decade ago. Newer Linux apps would include lightworks (Thelma shoonmakers weapon of choice) and Nuke studio the conform and assembly champion of vfx houses. It's not so odd. In the context of this article, I felt that Flame and Nuke fall within the compositing/effect/lookdev category more than in "video editing". It's arguable. Note that Heiro is part of Nuke studio, and is the closest thing to what most people think of when an article says "video editing". Maybe in the future, it would be useful to write an article about the effects side of the process, covering things like Blender, Natron (https://opensource.com/life/15/7/getting-started-with-natron), Synfig rotoscoping, and whatever else, along with the obligatory mention of Flame, Nuke, and kin. Would good to have the versions that you used. Things change quickly, so todays stable is tomorrows unstable and vice-versa. I didn't review these applications based on one version, but on my experience with them over the course of several years: about 8 with Kdenlive, 5 with most of the others. As you say, software rapidly changes, so a version number today becomes meaningless by the end of the year. "Stable" is a fuzzy metric, anyway. What's stable for me and my workflow could crash for someone expecting to edit animated GIFs like video, or it may appear unstable to someone who has no sense of media management (constantly moving video files without telling you editor about the change in location, for example). I see this article as a list of tested editors with either a good track record or particular prominence in the industry. Learn them, and find one that's comfortable or that fits your workflow, and you'll be a happy camper. Need to look at cinelerra-gg now rather than just dismissing the original version of cinelerra as cin 5.1/cgg has been brought up to date in the last 2 years. This website rates kdenlive at 15 but cinelerra-gg at 45 and it works on a lot of different linux O/S. Most people pick an O/S first; not an NLE. Thanks for the suggestion. I'm aware of Cinelerra, but I admit I haven't been able to fully comprehend its development model or release cycle enough, yet, to confidently build a production on it. That said, there are lots of interesting video editing projects out there that I haven't included in this article, because I wanted to limit the scope to what I consider to be reliable, pragmatic, dependable, and all-round above-average options. an amazing entry missing on this list is Fusion 8 from blackmagic. I am using it on Ubuntu 16.04 and it's nothing short of awesome. I've not used that one. I'll have to investigate for the future. Thanks! Thanks much, Seth, for helping me with this article. It hits the sweet spot between brief and useful.